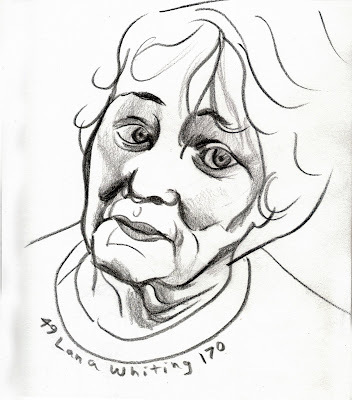 Drawing of my mom from my Fall 2006 black sketchbook. My favorite drawing from that particular sketchbook. So wait, is she 49 or 170? It seems like she's aged pretty well. I'll be stopping back by--keep posting. PS, after looking at the rest of the stuff you have up here, I've decided you should dedicate your life to watercolor--you've got some really nice paintings. Nice blog you've got there! I like this drawing, and the helicopter heads. Keep posting, and I'll keep visiting. Deal?